The March for Life held in Rome, Italy was the synthesis of the many events that during the year to affirm the importance of defending human life. Virginia Coda Nunziante, the president of the organizing committee has defined the eighth edition of the most important pro-life event in Italy. This is the 40th anniversary of the legal abortions in Italy of May 22. "There is a book of lives and there is a book of death – said Coda Nunziante – In this death book is the date of May 22, 1978 in Letters written from blood, the blood of nearly 6 million victims, 6 million of unborn children who send us a message that we want to collect: it is the silent cry, I use the expression of a famous document of Dr. Nathanson, whose echo does not go out and we want to reinforce and pass on. "According to the president, 50 million children were killed every year in the world, 137,000 per day, 5,700 per hour. On Saturday afternoon of May 20 thousands gathered in the Piazza della Repubblica for Rome’s annual March for Life. The March got underway around 4 p.m. This year it began far from Via della Conciliazione and ended next to Piazza Venezia. 20 foreign groups joined the March, including some from the United States and Canada. A spirited band of seminarian drummers kept marchers upbeat. 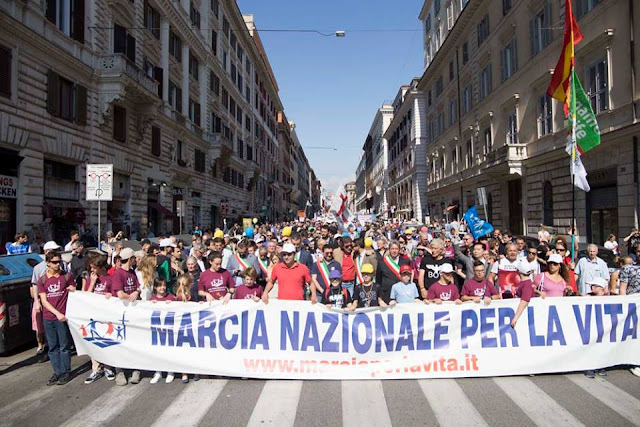 Also marching were pro-life scientists, doctors, and pharmacists, representing the thousands of medical personnel who are conscientious objectors to abortion, euthanasia, and abortifacient pharmaceuticals—all opponents to Law194/78, which brought legal abortion to Italy nearly 40 years ago. Among the few dignitaries present was Cardinal Raymond Burke. One speaker was Stéphane Mercier, a philosophy professor at the Catholic University of Louvain in Belgium, who spoke about his recent suspension for describing what happens in an abortion to his students. Gianna Jessen, an American who has cerebral palsy, was also speaking. She told how, in 1977, she was born alive at seven and a half months after her mother underwent a saline abortion that failed. She was saved because her unexpected arrival happened early in the morning before the abortionist arrived. Then Roberto Brazzale spoke, he is a businessman and owner of a prominent dairy company in Vicenza, in Northern Italy, which has over 500 employees. He explained his company’s policy is to grant every employee with at least two years’ service a special “baby bonus” of €1,500 to help support a new child and urged other employers to follow his example. Someone read a statement from Pope Francis, which had been transmitted through his Secretary of State, Cardinal Pietro Parolin, The Pope expressed his wish that “the event might favor adherence to the values of human life and welcoming of this divine gift in all of its fascinating richness.” Then the March’s president and Chief organizer, Virginia Coda Nunziante, said “The piazza is full..We are an immense crowd. The people of life want to be a positive presence that takes on the responsibility to defend not only the value of life [which is] a free and exclusive gift of God, but also the defense of all those who, weak or defenseless, cannot react and become castoffs of our hedonistic society.” The marchers, their slogans, and the real-life testimonies of believers and supporters of life sent a strong and clear message to politicians (and others) from Rome to Brussels and beyond: Thou shalt not kill! (Vincenzina Santoro) National March for Life was this year is dedicated to Alfie Evans, the child to whom was given Italian citizenship and yet died in hospital.